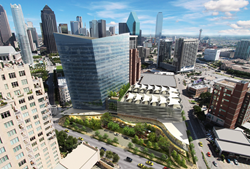 Crescent's McKinney & Olive office tower development in Uptown Dallas features stunning views of Uptown, Dallas' Arts District and Klyde Warren Park. Bringing brands like Saatchi & Saatchi and Team One to McKinney & Olive validates that firms are looking for the features offered here – architectural beauty, modern amenities, and a vibrant, pedestrian-friendly, neighborhood-oriented location. Crescent Real Estate Holdings LLC has achieved a major coup by landing the openings of new Dallas offices by Saatchi & Saatchi and Team One to McKinney & Olive, Crescent’s newest development in Dallas’ Uptown. Saatchi & Saatchi – the agency of record for Toyota Motor Sales, U.S.A., Inc. – along with sister company, Team One, agency of record for the Lexus brand, will lease a minimum of 52,000 square feet of the 20-story office tower. Saatchi & Saatchi and Team One were represented by Matthew Miller, vice chairman of Cresa in the transaction. John Zogg, managing director of Crescent Real Estate Equities, LLC, represented the owner. The decision by the two powerhouse advertising agencies, both currently based in the Los Angeles area, to expand into Dallas comes almost two years after Toyota’s announcement to unify its U.S. sales, engineering and finance operations at a new corporate headquarters in Plano, Texas. Both Saatchi & Saatchi and Team One’s Los Angeles offices will remain open. McKinney & Olive is a one-of-a-kind, mixed-use project offering world-class architecture by award-winning firm Pelli Clarke Pelli Architects, plus premier, Class-A office space and unrivaled visibility in the vibrant pedestrian-oriented Uptown Dallas neighborhood. The 530,000-square-foot structure will be the first commercial building in Dallas to be designed by an internationally acclaimed architect since the 1980s. Saatchi & Saatchi and Team One are within the global Saatchi & Saatchi network of 130 offices in 70 countries, and a division of Publicis Groupe, the third-largest communications group in the world. “At Team One, we aim to launch remarkable ideas into the world and expertly guide our clients into the future,” said Paul Silverman, executive director and managing director of Team One Dallas. “A space like McKinney & Olive will allow our teams to work collaboratively and seamlessly with our Playa Vista headquarters, along with our other offices in New York, Atlanta, Washington, D.C., and Chicago. A world-class city like Dallas will provide inspiration and fresh thinking to our offices and clients both around the corner and the globe." John Goff, chairman and chief executive officer of Crescent Real Estate Equities, LLC, is delighted to welcome the stellar agencies to the Uptown officer tower. “Bringing brands like Saatchi & Saatchi and Team One to McKinney & Olive validates that firms are looking for the features offered here – architectural beauty, modern amenities, and a vibrant, pedestrian-friendly, neighborhood-oriented location,” added Goff. Saatchi & Saatchi and Team One join Gardere Wynne Sewell LLP and Sidley Austin LLP at McKinney & Olive, along with a host of other firms announcing leases in coming months. Goff says interest is extremely high, and they anticipate being fully leased before the building opens. With completion set for late summer 2016, McKinney & Olive’s ultra-premium design and extraordinary features are emerging – the two-and-a-half story lobby with crystal-clear glass, the 1-acre piazza and community gathering space, and the graceful canopy with eye-catching oculi that is both aesthetically beautiful and structural. Also, the corners of the building have been specially designed to be column-free so that the floor-to-ceiling glass walls offer stunning unobstructed city views up and down McKinney Ave., throughout Uptown, over to downtown Dallas’ Arts District and Klyde Warren Park. Other highlights include the dramatic Carrara marble – extracted from the legendary Italian quarries that Michelangelo once surveyed and prospected – that has been installed in the stunning grand lobby, glass elevator lobbies in the parking garages to create an uplifting path to offices and retail spots, and 10-foot ceilings in offices with highly efficient floor plates. Beyond the sweeping views of Uptown and Downtown Dallas, the building is enhanced by McKinney & Olive’s piazza, which will be filled with umbrella-covered tables, park benches, water features, a fire pit and more. The piazza, surrounding grounds and rooftop garden are designed by acclaimed landscape architect, The Office of James Burnett, who crafted Klyde Warren Park, The Ritz-Carlton, Dallas and the $33-million streetscape renovation currently underway at The Crescent®. In addition to its bold, sculptural design, McKinney & Olive will feature state-of-the-art security, destination elevators, an outdoor landscaped garden on the fifth floor, a fitness center designed by Canyon Ranch® and a conference center. In an effort to serve customers and the community, 50,000 square feet of McKinney & Olive is dedicated to ground-floor retail, including its flagship restaurant Del Frisco’s Double Eagle Steakhouse. Located on a 3.1-acre site at McKinney Avenue and Olive Street, the tower is juxtaposed amid the grandeur of the neighboring Ritz-Carlton and The Crescent® and just blocks from downtown’s Dallas Arts District and Klyde Warren Park. As is the mission with its other properties, Crescent will provide exceptional customer service at McKinney & Olive. Crescent has been recognized 10 times with the prestigious National Commercial Real Estate Customer Service Award for Excellence, or the “A List” Award, from CEL & Associates, Inc.
There’s only one! For more information, visit mckinneyandolive.com. Crescent Real Estate Holdings LLC, headquartered in Fort Worth, Texas, is a fully-integrated real estate company owned by Goff Capital and Barclays Capital. Through its subsidiaries, Crescent manages and develops premier, Class A office buildings. Crescent also holds investments in resort residential developments in locations such as Scottsdale, Vail Valley, and Lake Tahoe; a luxury hotel, The Ritz-Carlton, Dallas; and the wellness lifestyle leader, Canyon Ranch®. For more information, visit crescent.com. Saatchi & Saatchi Los Angeles is located in Torrance, California and is part of the global Saatchi & Saatchi network of 130 offices in 70 countries, and is owned by the Publicis Groupe, the third largest communications group in the world. As the agency of record for Toyota Motor Sales (TMS), U.S.A., Inc., the LA-based office employs more than 400 full-time employees and has been a trusted partner of TMS since 1975. For more information, please visit Saatchi & Saatchi Los Angeles online at saatchila.com. Team One is Saatchi & Saatchi’s fully integrated premium, luxury and aspirational brand agency. With its very first campaign, Team One became a part of one of the most successful brand launches in history. The company’s storied introduction of the Lexus brand – from unlikely challenger to the top-selling luxury nameplate in the U.S. – turned out to be just the beginning. Since then, launching remarkable ideas, brands and products has become the agency’s hallmark. Team One’s 495 employees work across six North American offices, including the Los Angeles headquarters, New York, Chicago, Atlanta, Washington, D.C., and soon-to-be Dallas. Current clients include Lexus, Lexus Dealer Association, The Ritz-Carlton, Electronic Arts, Indian Motorcycle, Icelandic Glacial Water, HSBC Premier, CBS Watch! magazine and Marriott Hotels and Resorts. Visit Team One at TeamOne-USA.com, on Facebook at Facebook.com/TeamOneUSA, or follow the agency on Twitter at @TeamOneUSA.